Blood pressure is increased due to fluid overload and production of vasoactive hormones created by the kidney via the renin–angiotensin system, increasing one's risk of developing hypertension and/or suffering from congestive heart failure. Urea accumulates, leading to azotemia and ultimately uremia (symptoms ranging from lethargy to pericarditis and encephalopathy). 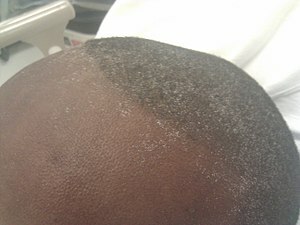 Due to its high systemic circulation, urea is excreted in eccrine sweat at high concentrations and crystallizes on skin as the sweat evaporates (" uremic frost"). Erythropoietin synthesis is decreased causing anemia. Fluid volume overload symptoms may range from mild edema to life-threatening pulmonary edema. Iron deficiency anemia, which increases in prevalence as kidney function decreases, is especially prevalent in those requiring haemodialysis. It is multifactoral in cause, but includes increased inflammation, reduction in erythropoietin, and hyperuricemia leading to bone marrow suppression. The most common cause of CKD as of 2015 is diabetes mellitus followed by high blood pressure and glomerulonephritis. Other causes of CKD include idiopathic (i.e. 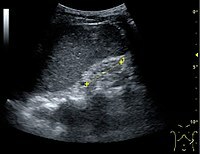 unknown cause, often associated with small kidneys on renal ultrasound). Together, these cause about 75% of all adult cases. Vascular disease includes large vessel disease such as bilateral renal artery stenosis and small vessel disease such as ischemic nephropathy, hemolytic-uremic syndrome, and vasculitis. Congenital disease such as polycystic kidney disease. Tubulointerstitial disease includes drug- and toxin-induced chronic tubulointerstitial nephritis, and reflux nephropathy. Obstructive nephropathy is exemplified by bilateral kidney stones and diseases of the prostate such as benign prostatic hyperplasia. On rare cases, pinworms infecting the kidney can also cause nephropathy. A 12-lead ECG of a person with CKD and a severe electrolyte imbalance: hyperkalemia (7.4 mmol/l) with hypocalcemia (1.6 mmol/l). The T-waves are peaked and the QT interval is prolonged. Diagnosis of CKD is largely based on history, examination and urine dipstick combined with the measurement of the serum creatinine level (see above). It is important to differentiate CKD from acute kidney injury (AKI) because AKI can be reversible. One diagnostic clue that helps differentiate CKD from AKI is a gradual rise in serum creatinine (over several months or years) as opposed to a sudden increase in the serum creatinine (several days to weeks). In many CKD patients, previous kidney disease or other underlying diseases are already known. A significant number present with CKD of unknown cause. Screening those who have neither symptoms nor risk factors for CKD is not recommended. Those who should be screened include: those with hypertension or history of cardiovascular disease, those with diabetes or marked obesity, those aged > 60 years, subjects with African American ancestry those with a history of kidney disease in the past and subjects who have relatives who had kidney disease requiring dialysis. Screening should include calculation of estimated GFR from the serum creatinine level, and measurement of urine albumin-to-creatinine ratio (ACR) in a first-morning urine specimen (this reflects the amount of a protein called albumin in the urine), as well as a urine dipstick screen for hematuria. The GFR (glomerular filtration rate) is derived from the serum creatinine and is proportional to 1/creatinine, i.e. it is a reciprocal relationship (the higher the creatinine, the lower the GFR). It reflects one aspect of kidney function: how efficiently the glomeruli (filtering units) work. But as they make up <5% of the mass of the kidney, the GFR does not indicate all aspects of kidney health and function. This can be done by combining the GFR level with the clinical assessment of the patient (especially fluid state) and measuring the levels of hemoglobin, potassium, phosphate and parathyroid hormone (PTH). Normal GFR is 90-120 mLs/min. The units of creatinine vary from country to country. Stage 4 Severe reduction in GFR (15–29 ml/min/1.73 m2)  Preparation for renal replacement therapy. Stage 5 Established kidney failure (GFR <15 ml/min/1.73 m2), permanent renal replacement therapy,  or end-stage kidney disease. The term "non-dialysis-dependent chronic kidney disease" (NDD-CKD) is a designation used to encompass the status of those persons with an established CKD who do not yet require the life-supporting treatments for kidney failure known as renal replacement therapy (RRT, including maintenance dialysis or kidney transplantation). The condition of individuals with CKD, who require either of the two types of renal replacement therapy ( dialysis or transplant), is referred to as the end-stage kidney disease (ESKD). Hence, the start of the ESKD is practically the irreversible conclusion of the NDD-CKD. Even though the NDD-CKD status refers to the status of persons with earlier stages of CKD (stages 1 to 4), patients with advanced stage of CKD (stage 5), who have not yet started renal replacement therapy, are also referred to as NDD-CKD. Apart from controlling other risk factors, the goal of therapy is to slow down or halt the progression of CKD. Control of blood pressure and treatment of the original disease are the broad principles of management. Although the use of ACE inhibitors and ARBs represents the current standard of care for people with CKD, people progressively lose kidney function while on these medications, as seen in the IDNT  and RENAL  studies, which reported a decrease over time in estimated GFR (an accurate measure of CKD progression, as detailed in the K/DOQI guidelines ) in people treated by these conventional methods. At stage 5 CKD, renal replacement therapy is usually required, in the form of either dialysis or a transplant. CKD increases the risk of cardiovascular disease, and people with CKD often have other risk factors for heart disease, such as high blood lipids. The most common cause of death in people with CKD is cardiovascular disease rather than kidney failure. People with high blood pressure and diabetes are also at high risk of suffering from CKD than those people without these underlying conditions. About one of five adults with hypertension and one of three adults with diabetes have CKD. Other health conditions that may lead to CKD are obesity, high cholesterol, a family history of the disease, lupus, and other forms of cardiovascular diseases. Studies have shown a true association between history of chronic kidney disease in first- or second-degree relatives, and risk of disease. In addition, African Americans may have higher serum levels of human leukocyte antigens (HLA). High HLA concentrations can contribute to increased systemic inflammation, which indirectly may lead to heightened susceptibility for developing kidney disease. Lack of nocturnal reduction in blood pressure among groups of African Americans is also offered as an explanation,  which lends further credence to a genetic cause of CKD racial disparities. In the US, the National Kidney Foundation is a national organization representing patients and professionals who treat kidney diseases. The American Kidney Fund is a national nonprofit organization providing treatment-related financial assistance to one of every five dialysis patients each year. The Renal Support Network is a nonprofit, patient-focused, patient-run organization that provides nonmedical services to those affected by CKD. The American Association of Kidney Patients is a nonprofit, patient-centric group focused on improving the health and well-being of CKD and dialysis patients. The Renal Physicians Association is an association representing nephrology professionals. In the United Kingdom, the UK National Kidney Federation and British Kidney Patient Association (BKPA) represents patients, and the Renal Association represents renal physicians and works closely with the National Service Framework for kidney disease. Kidney Health Australia serves that country. The International Society of Nephrology is an international body representing specialists in kidney diseases. ^ a b c Bikbov B, Perico N, Remuzzi G (23 May 2018). "Disparities in Chronic Kidney Disease Prevalence among Males and Females in 195 Countries: Analysis of the Global Burden of Disease 2016 Study". Nephron. 139 (4): 313–318. doi: 10.1159/000489897. PMID 29791905. ^ a b c d e f "What Is Chronic Kidney Disease?". National Institute of Diabetes and Digestive and Kidney Diseases. June 2017. Retrieved 19 December 2017. ^ a b Liao, Min-Tser; Sung, Chih-Chien; Hung, Kuo-Chin; Wu, Chia-Chao; Lo, Lan; Lu, Kuo-Cheng (2012). "Insulin Resistance in Patients with Chronic Kidney Disease". Journal of Biomedicine and Biotechnology. 2012: 1–5. doi: 10.1155/2012/691369. PMC 3420350. PMID 22919275. ^ a b "Kidney Failure". MedlinePlus. Retrieved 11 November 2017. ^ a b c d e "What is renal failure?". Johns Hopkins Medicine. Retrieved 18 December 2017. ^ a b c d e GBD 2015 Mortality and Causes of Death, Collaborators. (8 October 2016). "Global, regional, and national life expectancy, all-cause mortality, and cause-specific mortality for 249 causes of death, 1980-2015: a systematic analysis for the Global Burden of Disease Study 2015". Lancet. 388 (10053): 1459–1544. doi: 10.1016/s0140-6736(16)31012-1. PMC 5388903. PMID 27733281. ^ a b c "Chronic Kidney Disease Tests & Diagnosis". National Institute of Diabetes and Digestive and Kidney Diseases. October 2016. Retrieved 19 December 2017. ^ a b "Kidney Failure". National Institute of Diabetes and Digestive and Kidney Diseases. Retrieved 11 November 2017. ^ a b c d "Managing Chronic Kidney Disease". National Institute of Diabetes and Digestive and Kidney Diseases. October 2016. ^ a b c d KDIGO: Kidney Disease Improving Global Outcomes (August 2009). "KDIGO Clinical Practice Guideline for the Diagnosis, Evaluation, Prevention, and Treatment of Chronic Kidney Disease-Mineral and Bone Disorder (CKD-MBD)" (PDF). Kidney Int. 76 (Suppl 113). ^ "Summary of Recommendation Statements". Kidney International Supplement. 3 (1): 5–14. January 2013. doi: 10.1038/kisup.2012.77. PMC 4284512. PMID 25598998. ^ Ferri, Fred F. (2017). Ferri's Clinical Advisor 2018 E-Book: 5 Books in 1. Elsevier Health Sciences. pp. 294–295. ISBN 9780323529570. ^ "Anemia in Chronic Kidney Disease". National Institute of Diabetes and Digestive and Kidney Diseases. July 2016. Retrieved 19 December 2017. ^ "Mineral & Bone Disorder in Chronic Kidney Disease". National Institute of Diabetes and Digestive and Kidney Diseases. November 2015. Retrieved 19 December 2017. ^ a b "Chronic Kidney Disease". medscape. 2018-09-16. ^ Hruska KA, Mathew S, Lund R, Qiu P, Pratt R (2008). "Hyperphosphatemia of chronic kidney disease". Kidney Int. 74 (2): 148–57. doi: 10.1038/ki.2008.130. PMC 2735026. PMID 18449174. ^ Faul C, Amaral AP, Oskouei B, Hu MC, Sloan A, Isakova T, Gutiérrez OM, Aguillon-Prada R, Lincoln J, Hare JM, Mundel P, Morales A, Scialla J, Fischer M, Soliman EZ, Chen J, Go AS, Rosas SE, Nessel L, Townsend RR, Feldman HI, St John Sutton M, Ojo A, Gadegbeku C, Di Marco GS, Reuter S, Kentrup D, Tiemann K, Brand M, Hill JA, Moe OW, Kuro-O M, Kusek JW, Keane MG, Wolf M (2011). "FGF23 induces left ventricular hypertrophy". J Clin Invest. 121 (11): 4393–408. doi: 10.1172/JCI46122. PMC 3204831. PMID 21985788. ^ Gutiérrez OM, Mannstadt M, Isakova T, Rauh-Hain JA, Tamez H, Shah A, Smith K, Lee H, Thadhani R, Jüppner H, Wolf M (2008). "Fibroblast growth factor 23 and mortality among patients undergoing hemodialysis". N Engl J Med. 359 (6): 584–92. doi: 10.1056/NEJMoa0706130. PMC 2890264. PMID 18687639. ^ Bacchetta J, Sea JL, Chun RF, Lisse TS, Wesseling-Perry K, Gales B, Adams JS, Salusky IB, Hewison M (August 2012). "FGF23 inhibits extra-renal synthesis of 1,25-dihydroxyvitamin D in human monocytes". J Bone Miner Res. 28 (1): 46–55. doi: 10.1002/jbmr.1740. PMC 3511915. PMID 22886720. ^ Bover J, Jara A, Trinidad P, Rodriguez M, Martin-Malo A, Felsenfeld AJ (1994). "The calcemic response to PTH in the rat: effect of elevated PTH levels and uremia". Kidney Int. 46 (2): 310–17. doi: 10.1038/ki.1994.276. PMID 7967341. ^ Brandenburg VM, Cozzolino M, Ketteler M (2011). "Calciphylaxis: a still unmet challenge". J. Nephrol. 24 (2): 142–48. doi: 10.5301/jn.2011.6366. PMID 21337312. ^ Moe S, Drüeke T, Cunningham J, Goodman W, Martin K, Olgaard K, Ott S, Sprague S, Lameire N, Eknoyan G (2006). "Definition, evaluation, and classification of renal osteodystrophy: a position statement from Kidney Disease: Improving Global Outcomes (KDIGO)". Kidney Int. 69 (11): 1945–53. doi: 10.1038/sj.ki.5000414. PMID 16641930. ^ Adrogué HJ, Madias NE (September 1981). "Changes in plasma potassium concentration during acute acid-base disturbances". Am. J. Med. 71 (3): 456–67. doi: 10.1016/0002-9343(81)90182-0. PMID 7025622. ^ Damman, Kevin; Valente, Mattia A. E.; Voors, Adriaan A.; O'Connor, Christopher M.; Veldhuisen, Dirk J. van; Hillege, Hans L. (2014-02-14). "Renal impairment, worsening renal function, and outcome in patients with heart failure: an updated meta-analysis". European Heart Journal. 35 (7): 455–69. doi: 10.1093/eurheartj/eht386. PMID 24164864. ^ a b Vecchio M, Navaneethan SD, Johnson DW, Lucisano G, Graziano G, Saglimbene V, Ruospo M, Querques M, Jannini EA, Strippoli GF (2010). "Interventions for treating sexual dysfunction in patients with chronic kidney disease". Cochrane Database Syst Rev (12): CD007747. doi: 10.1002/14651858.CD007747.pub2. PMID 21154382. ^ GBD 2015 Disease and Injury Incidence and Prevalence, Collaborators. (8 October 2016). "Global, regional, and national incidence, prevalence, and years lived with disability for 310 diseases and injuries, 1990-2015: a systematic analysis for the Global Burden of Disease Study 2015". Lancet. 388 (10053): 1545–1602. doi: 10.1016/S0140-6736(16)31678-6. PMC 5055577. PMID 27733282. ^ "United States Renal Data System (USRDS)". Archived from the original on 2007-02-13. ^ Rahman, Mahboob; Smith, Michael C. (September 1998). "Chronic renal insufficiency: A diagnostic and therapeutic approach". Archives of Internal Medicine. 158 (16): 1743–52. doi: 10.1001/archinte.158.16.1743. PMID 9738603. ^ a b Redmon JH, Elledge MF, Womack DS, Wickremashinghe R, Wanigasuriya KP, Peiris-John RJ, Lunyera J, Smith K, Raymer JH, Levine KE (2014). "Additional perspectives on chronic kidney disease of unknown aetiology (CKDu) in Sri Lanka – lessons learned from the WHO CKDu population prevalence study". BMC Nephrology. 15 (1): 125. doi: 10.1186/1471-2369-15-125. PMC 4120717. PMID 25069485. ^ Orantes CM, Herrera R, Almaguer M, Brizuela EG, Núñez L, Alvarado NP, Fuentes EJ, Bayarre HD, Amaya JC, Calero DJ, Vela XF, Zelaya SM, Granados DV, Orellana P (2014). "Epidemiology of chronic kidney disease in adults of Salvadoran agricultural communities". MEDICC Rev. 16 (2): 23–30. PMID 24878646. ^ Vanholder, R; De Smet, R; Glorieux, G; Argilés, A; Baurmeister, U; Brunet, P; Clark, W; Cohen, G; De Deyn, PP; Deppisch, R; Descamps-Latscha, B; Henle, T; Jörres, A; Lemke, HD; Massy, ZA; Passlick-Deetjen, J; Rodriguez, M; Stegmayr, B; Stenvinkel, P; Tetta, C; Wanner, C; Zidek, W; European Uremic Toxin Work Group, (EUTox). (May 2003). "Review on uremic toxins: classification, concentration, and interindividual variability". Kidney International. 63 (5): 1934–43. doi: 10.1046/j.1523-1755.2003.00924.x. PMID 12675874. ^ Yamamoto, Suguru; Kazama, Junichiro James; Wakamatsu, Takuya; Takahashi, Yoshimitsu; Kaneko, Yoshikatsu; Goto, Shin; Narita, Ichiei (14 September 2016). "Removal of uremic toxins by renal replacement therapies: a review of current progress and future perspectives". Renal Replacement Therapy. 2 (1). doi: 10.1186/s41100-016-0056-9. ^ Qaseem A, Hopkins RH, Sweet DE, Starkey M, Shekelle P (22 October 2013). "Screening, Monitoring, and Treatment of Stage 1 to 4 Chronic Kidney Disease: A Clinical Practice Guideline From the Clinical Guidelines Committee of the American College of Physicians". Annals of Internal Medicine. 159 (12): 835–47. doi: 10.7326/0003-4819-159-12-201312170-00726. PMID 24145991. ^ Weckmann, GFC; Stracke, S; Haase, A; Spallek, J; Ludwig, F; Angelow, A; Emmelkamp, JM; Mahner, M; Chenot, JF (11 October 2018). "Diagnosis and management of non-dialysis chronic kidney disease in ambulatory care: a systematic review of clinical practice guidelines". BMC Nephrology. 19 (1): 258. doi: 10.1186/s12882-018-1048-5. PMC 6180496. PMID 30305035. ^ Johnson, David (2011-05-02). "Chapter 4: CKD Screening and Management: Overview". In Daugirdas, John (ed.). Handbook of Chronic Kidney Disease Management. Lippincott Williams and Wilkins. pp. 32–43. ISBN 978-1-58255-893-6. ^ a b c d e f g National Kidney Foundation (2002). "K/DOQI clinical practice guidelines for chronic kidney disease". Retrieved 2008-06-29. ^ a b National Institute for Health and Clinical Excellence. Clinical guideline 73: Chronic kidney disease. London, 2008. ^ a b c Xie, X; Liu, Y; Perkovic, V; Li, X; Ninomiya, T; Hou, W; Zhao, N; Liu, L; Lv, J; Zhang, H; Wang, H (November 2015). "Renin–Angiotensin System Inhibitors and Kidney and Cardiovascular Outcomes in Patients With CKD: A Bayesian Network Meta-analysis of Randomized Clinical Trials". American Journal of Kidney Diseases (Systematic Review & Meta-Analysis). S0272-6386 (15): 01312–8. doi: 10.1053/j.ajkd.2015.10.011. PMID 26597926. ^ Malhotra, Rakesh; Nguyen, Hoang Anh; Benavente, Oscar; Mete, Mihriye; Howard, Barbara V.; Mant, Jonathan; Odden, Michelle C.; Peralta, Carmen A.; Cheung, Alfred K.; Nadkarni, Girish N.; Coleman, Ruth L.; Holman, Rury R.; Zanchetti, Alberto; Peters, Ruth; Beckett, Nigel; Staessen, Jan A.; Ix, Joachim H. (5 September 2017). "Association Between More Intensive vs Less Intensive Blood Pressure Lowering and Risk of Mortality in Chronic Kidney Disease Stages 3 to 5". JAMA Internal Medicine. 177 (10): 1498–1505. doi: 10.1001/jamainternmed.2017.4377. PMC 5704908. PMID 28873137. ^ Lewis EJ, Hunsicker LG, Clarke WR, Berl T, Pohl MA, Lewis JB, Ritz E, Atkins RC, Rohde R, Raz I (2001). "Renoprotective effect of the angiotensin-receptor antagonist irbesartan in patients with nephropathy due to type 2 diabetes". N Engl J Med. 345 (12): 851–60. doi: 10.1056/NEJMoa011303. hdl: 2445/122787. PMID 11565517. ^ Brenner BM, Cooper ME, de Zeeuw D, Keane WF, Mitch WE, Parving HH, Remuzzi G, Snapinn SM, Zhang Z, Shahinfar S (2001). "Effects of losartan on renal and cardiovascular outcomes in patients with type 2 diabetes and nephropathy". N Engl J Med. 345 (12): 861–69. doi: 10.1056/NEJMoa011161. hdl: 2445/122643. PMID 11565518. ^ Chauhan V, Vaid M (November 2009). "Dyslipidemia in chronic kidney disease: managing a high-risk combination". Postgrad Med. 121 (6): 54–61. doi: 10.3810/pgm.2009.11.2077. PMID 19940417. ^ Kalantar-Zadeh K, Fouque D (Nov 2, 2017). "Nutritional management of chronic kidney disease". N. Engl. J. Med. 377 (18): 1765–1776. doi: 10.1056/NEJMra1700312. PMID 29091561. ^ "Anaemia management in people with chronic kidney disease (CG114)". NICE Clinical Guideline. UK National Institute for Health and Care Excellence. February 2011. ^ Locatelli F, Aljama P, Canaud B, Covic A, De Francisco A, Macdougall IC, Wiecek A, Vanholder R (September 2010). "Target haemoglobin to aim for with erythropoiesis-stimulating agents: a position statement by ERBP following publication of the Trial to reduce cardiovascular events with Aranesp therapy (TREAT) study". Nephrol Dial Transplant. 25 (9): 2846–50. doi: 10.1093/ndt/gfq336. PMID 20591813. ^ Clement FM, Klarenbach S, Tonelli M, Johnson JA, Manns BJ (22 June 2009). "The impact of selecting a high hemoglobin target level on health-related quality of life for patients with chronic kidney disease: a systematic review and meta-analysis". Archives of Internal Medicine. 169 (12): 1104–12. doi: 10.1001/archinternmed.2009.112. PMID 19546410. ^ a b Levin A, Hemmelgarn B, Culleton B, Tobe S, McFarlane P, Ruzicka M, Burns K, Manns B, White C, Madore F, Moist L, Klarenbach S, Barrett B, Foley R, Jindal K, Senior P, Pannu N, Shurraw S, Akbari A, Cohn A, Reslerova M, Deved V, Mendelssohn D, Nesrallah G, Kappel J, Tonelli M (November 2008). "Guidelines for the management of chronic kidney disease". CMAJ. 179 (11): 1154–62. doi: 10.1503/cmaj.080351. PMC 2582781. PMID 19015566. ^ Yang, Q; Abudou, M; Xie, XS; Wu, T (Oct 9, 2014). "Androgens for the anaemia of chronic kidney disease in adults". The Cochrane Database of Systematic Reviews. 10 (10): CD006881. doi: 10.1002/14651858.CD006881.pub2. PMID 25300168. ^ a b Perazella MA, Khan S (March 2006). "Increased mortality in chronic kidney disease: a call to action". Am. J. Med. Sci. 331 (3): 150–53. doi: 10.1097/00000441-200603000-00007. PMID 16538076. ^ Sarnak MJ, Levey AS, Schoolwerth AC, Coresh J, Culleton B, Hamm LL, McCullough PA, Kasiske BL, Kelepouris E, Klag MJ, Parfrey P, Pfeffer M, Raij L, Spinosa DJ, Wilson PW (October 2003). "Kidney disease as a risk factor for development of cardiovascular disease: a statement from the American Heart Association Councils on Kidney in Cardiovascular Disease, High Blood Pressure Research, Clinical Cardiology, and Epidemiology and Prevention". Circulation. 108 (17): 2154–69. doi: 10.1161/01.CIR.0000095676.90936.80. PMID 14581387. ^ Tonelli M, Wiebe N, Culleton B, House A, Rabbat C, Fok M, McAlister F, Garg AX (July 2006). "Chronic kidney disease and mortality risk: a systematic review". J. Am. Soc. Nephrol. 17 (7): 2034–47. doi: 10.1681/ASN.2005101085. PMID 16738019. ^ Heidenheim AP, Kooistra MP, Lindsay RM (2004). Quality of life. Contrib Nephrol. Contributions to Nephrology. 145. pp. 99–105. doi: 10.1159/000081673. ISBN 978-3-8055-7808-0. PMID 15496796. ^ de Francisco AL, Piñera C (January 2006). "Challenges and future of renal replacement therapy". Hemodial Int. 10 (Suppl 1): S19–23. doi: 10.1111/j.1542-4758.2006.01185.x. PMID 16441862. ^ Groothoff JW (July 2005). "Long-term outcomes of children with end-stage renal disease". Pediatr. Nephrol. 20 (7): 849–53. doi: 10.1007/s00467-005-1878-9. PMID 15834618. ^ Giri M (2004). "Choice of renal replacement therapy in patients with diabetic end stage renal disease". Edtna Erca J. 30 (3): 138–42. doi: 10.1111/j.1755-6686.2004.tb00353.x. PMID 15715116. ^ Pierratos A, McFarlane P, Chan CT (March 2005). "Quotidian dialysis–update 2005". Curr. Opin. Nephrol. Hypertens. 14 (2): 119–24. doi: 10.1097/00041552-200503000-00006. PMID 15687837. ^ a b Maisonneuve P, Agodoa L, Gellert R, Stewart JH, Buccianti G, Lowenfels AB, Wolfe RA, Jones E, Disney AP, Briggs D, McCredie M, Boyle P (1999). "Cancer in patients on dialysis for end-stage renal disease: An international collaborative study". Lancet. 354 (9173): 93–99. doi: 10.1016/S0140-6736(99)06154-1. PMID 10408483. ^ Chertow GM, Paltiel AD, Owen WF, Lazarus JM (1996). "Cost-effectiveness of Cancer Screening in End-Stage Renal Disease". Archives of Internal Medicine. 156 (12): 1345–50. doi: 10.1001/archinte.1996.00440110117016. PMID 8651845. ^ a b c Appel LJ, Wright JT, Greene T, Kusek JW, Lewis JB, Wang X, Lipkowitz MS, Norris KC, Bakris GL, Rahman M, Contreras G, Rostand SG, Kopple JD, Gabbai FB, Schulman GI, Gassman JJ, Charleston J, Agodoa LY (April 2008). "Long-term effects of renin–angiotensin system-blocking therapy and a low blood pressure goal on progression of hypertensive chronic kidney disease in African Americans". Arch. Intern. Med. 168 (8): 832–39. doi: 10.1001/archinte.168.8.832. PMC 3870204. PMID 18443258. ^ Centers for Disease Control Prevention (CDC) (March 2007). "Prevalence of chronic kidney disease and associated risk factors—United States, 1999–2004". MMWR Morb. Mortal. Wkly. Rep. 56 (8): 161–65. PMID 17332726. ^ Morgan T (21 January 2009). "Chronic Kidney Disease (stages 3–5) prevalence estimates using data from the Neoerica study (2007)". Association of Public Health Observatories. ^ a b c Klag MJ, Whelton PK, Randall BL, Neaton JD, Brancati FL, Stamler J (1997). "End-stage renal disease in African-American and white men. 16-year MRFIT findings". JAMA. 277 (16): 1293–98. doi: 10.1001/jama.1997.03540400043029. PMID 9109467. ^ Tangri N (29 July 2013). "MesoAmerican Nephropathy: A New Entity". eAJKD. National Kidney Foundation. ^ Wesseling C, Crowe J, Hogstedt C, Jakobsson K, Lucas R, Wegman DH (November 2013). "The epidemic of chronic kidney disease of unknown etiology in Mesoamerica: a call for interdisciplinary research and action". Am J Public Health. 103 (11): 1927–30. doi: 10.2105/AJPH.2013.301594. PMC 3828726. PMID 24028232. ^ Johnson RJ, Sánchez-Lozada LG (October 2013). "Chronic kidney disease: Mesoamerican nephropathy – new clues to the cause". Nat Rev Nephrol. 9 (10): 560–61. doi: 10.1038/nrneph.2013.174. PMID 23999393. ^ Roncal Jimenez CA, Ishimoto T, Lanaspa MA, Rivard CJ, Nakagawa T, Ejaz AA, Cicerchi C, Inaba S, Le M, Miyazaki M, Glaser J, Correa-Rotter R, González MA, Aragón A, Wesseling C, Sánchez-Lozada LG, Johnson RJ (August 2014). "Fructokinase activity mediates dehydration-induced renal injury". Kidney Int. 86 (2): 294–302. doi: 10.1038/ki.2013.492. PMC 4120672. PMID 24336030. ^ Chavkin, Sasha; Greene, Ronnie (12 December 2011). "Thousands of sugar cane workers die as wealthy nations stall on solutions". International Consortium of Investigative Journalists. Retrieved November 26, 2012. ^ Orantes CM, Herrera R, Almaguer M, Brizuela EG, Hernández CE, Bayarre H, Amaya JC, Calero DJ, Orellana P, Colindres RM, Velázquez ME, Núñez SG, Contreras VM, Castro BE (October 2011). "Chronic kidney disease and associated risk factors in the Bajo Lempa region of El Salvador: Nefrolempa study, 2009" (PDF). MEDICC Rev. 13 (4): 14–22. PMID 22143603. ^ Lena, Pelander, (2018). Chronic kidney disease in the dog. ISBN 978-91-7760-208-8. Retrieved 8 June 2018. ^ Pelander, L.; Ljungvall, I.; Egenvall, A.; Syme, H.; Elliott, J.; Häggström, J. (4 May 2015). "Incidence of and mortality from kidney disease in over 600,000 insured Swedish dogs". Veterinary Record. 176 (25): 656. doi: 10.1136/vr.103059. PMID 25940343.